This post is copied from Burma Digest. The Democratic Voice of Burma has been accumulating information about a nuclear program in Burma for years, but recently they have come across a source with truly extraordinary information. He worked in special factories making prototype components for missile and nuclear programs. Like the Israeli technician, Mordecai Vanunu, he has brought hundreds of color photographs of the activities inside these factories. DVB has asked us to organize this information and analyze what it means. The goal of this report is to report our findings to DVB in support of their documentary film on Al Jazeera. We are also providing a great deal of raw data for the nonproliferation community to assess. Burma is one of the world’s most repressive regimes. It is ruled by a junta of generals who have been in power for decades. These generals seem to have no political philosophy, such as socialism or fascism, only pure simple greed. To remain in power they depend on a brutal secret police and suspension of most human rights. With the passage of time they seek more ways to hang onto power as their wealth grows ever larger and the dissatisfaction of the population threatens to oust them. There are many signs that Burma looks to maintain power by having military power that would make foreign intervention very painful for an aggressor. The power may not be necessarily aimed at aggression by Burma on its neighbors; rather it is a defensive power that signals its neighbors to leave them alone. The model for this is the Democratic People’s Republic of Korea, DPRK, commonly known as North Korea. North Korea is too poor to threaten anyone except its immediate neighbors but its possession of nuclear weapons inhibits any outside intervention in its repressive regime. 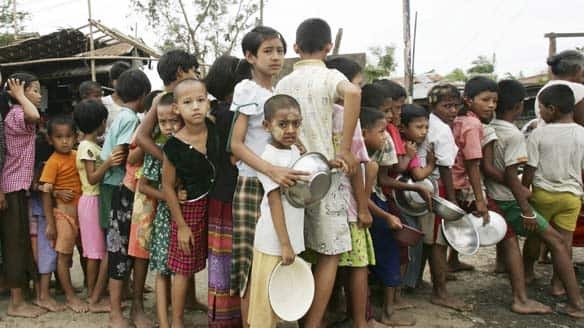 There are many reports of a nuclear program in Burma. (3) Most of them have been sketchy and in some cases technically incredible. Now the Democratic Voice of Burma (DVB) has assembled a huge new body of information that confirms many sources that Burma is investigating nuclear technology. The majority of the new information comes from one source, which is always a concern for credibility. This source is an educated man, a former Burmese Army Major, Sai Thein Win (STW), who understands what he knows and separates his information into what he knows well and what is hearsay. He has a good sense of the organization of Burma’s special military programs and is much more of an expert on their missile projects than he is on nuclear matters. His information on nuclear program organization is impressive and it correlates well with information from other published and unpublished sources. But the most important thing he has brought forth is hundreds of color photographs taken inside critical facilities in Burma. Photographs could be faked, but there are so many and they are so consistent with other information and within themselves that they lead to a high degree of confidence that Burma is pursuing nuclear technology. Our analysis leads to only one conclusion: this technology is only for nuclear weapons and not civilian use or nuclear power. There is very little doubt that Burma has a nuclear program. It is headed by Dr. Ko Ko Oo who has attended meetings abroad and openly asserts his interest in nuclear matters. This program has a small connection to the International Atomic Energy Agency (IAEA) in Vienna. The ties to IAEA are in mostly in civil matters such as the use of isotopes in medicine and agriculture, but there are also training courses for Burmese scientists in nuclear technology. Burma does not have any declared nuclear facilities and it claims to have little or no nuclear material. (4) This situation means that the IAEA does not conduct any inspections in Burma because both sides have agreed there is nothing to inspect. The situation with IAEA will be explained in more detail later in this paper. Currently Burma’s nuclear effort is managed by the Directorate of Defence Services Science and Technology Research Center (DDSSTRC). This organization is located in May Myo, also called Pyin Oo Lwin at the Defense Services Technological Academy (DSTA). It is a large complex for the education of military officers and for research. It is primarily a headquarters site and probably does not conduct experimental research, at least with nuclear materials or explosives. The DDSSTRC is responsible for a program, which according to sources, is charged with building a nuclear reactor, enriching uranium, and building a nuclear weapon. It is clear that this is a very difficult task for Burma to successfully accomplish. Much of what STW is providing suggests Burma has little chance of succeeding in its quest, but that does not change the fact that even trying to build a bomb is a serious violation of its international agreements. It would also seem that the very act of trying to build nuclear weapons is a sign of desperation and fear, no matter how unlikely it is to succeed. Our assessment of multiple sources is that Burma is really developing nuclear technology, that it has built specialized equipment and facilities, and it has issued orders to a cadre to build a program. The cadre in charge is known as the Number 1 Science and Technology Regiment at Thabeikkyin. (8) It is colloquially referred to as the “Nuclear Battalion” and we will adopt that term as well. Major General Sein Win and Lt.-Col. Win Ko have signed a document directing a special factory to produce a part for the No. (1) Scientific and Technology Regiment. This document is important and will surface again when we look at equipment that is needed for the Nuclear Battalion. There are many reported activities at Thabeikkyin. Previous reports have associated it with mining or ore concentration. This latest source goes further and describes it as a site where “dangerous” ore is brought and stored. He also believes that the site is involved in trying to produce “yellowcake” but he is not sure what this material is or if they have been successful. In Google Earth imagery we can see a small ore concentration plant and ore reserve about 7 miles east of the Irrawaddy at Thabeikkyin. This is very close to the point he describes. A group of buildings with one thickener and a tailings pond are visible. There is a pile of ore nearby. This could be a uranium ore concentration plant, consistent with multiple source reports of uranium mining in this general area. The mine itself has not been found. Figure 2. A small ore concentration plant is visible at the location of Thabeikkyin given by the latest source. STW visited Thabeikkyin on two occasions, in 2006 and 2007 and reported on the following points. The first and most important is that the mission is to build a nuclear reactor and to enrich uranium for a nuclear bomb. There is considerable research work at the site devoted to this end. It is not clear that either the reactor or enrichment plant would actually be built, possibly only designed here. He did not visit the ore plant but he did visit laboratories in small buildings for a demonstration to General Mg Aye. He saw two demonstrations of technology. The first was a powerful laser, reportedly a carbon-monoxide (CO) laser that was used to burn a hole in a stick. The beam was a small red spot. One of his colleagues later confided to him that CO laser beams are invisible so the spot was not from that laser, but maybe a guide or pointing laser. The audience of military offices was very impressed. The top general in the country, Than Shwe attended a second demonstration on a subsequent visit: a “control rod drive.” This consisted of a microprocessor moving a control element up and down in a laboratory. This sounds like an extremely simple task and not very impressive but again the military officers were pleased. Sai, without prompting gave a technically credible explanation of how a control rod affects the criticality of a reactor by absorbing neutrons. Otherwise we would not be so sure that the demonstration he saw had any nuclear application. STW can give the names of a few researchers at Thabeikkyin. Details of the technology are in a later section of this analysis. The Nuclear Battalion controls two important factories. These factories are dedicated to making prototypes and special components for the missile and nuclear programs. Number (1) Science and Technological Material Production Workshop will be abbreviated as “Factory 1” in this report. It is located east of Pyin Oo Lwin (also known as Maymyo.) It was purposely built for the military research programs. Factory 1 has been more closely associated with the nuclear program than the missile program but has worked for both. It is also known by the name Naung Laing. Number (2) Science and Technological Material Production Workshop, “Factory 2,” is located near Myaing in the western part of Burma. This factory is supposedly almost identical to Factory 1 but it is more tied to the Burmese missile program. That program is allegedly planning to make prototype parts for SCUD liquid fueled missiles. Burma has a Memorandum of Understanding (MOU) with DPRK on producing SCUDs so it is not unreasonable to consider there is a link between Factory 2 and the DPRK MOU. The western world and DVB know a great deal about the equipment and capability inside these two buildings. A great deal of the equipment in the buildings is large scale, precision, Computer Numerically Controlled (CNC) machine tools. These tools are largely of German and Swiss origin, along with some measuring equipment from Japan. There are multiple correlations between satellite imagery, end-user verification, and photos of equipment being installed by German technicians, and even photos of the expert and the diplomat during end-user verification inspections. STW served one and one half years as an army major and deputy director in Factory 2 and then a few months in Factory 1 in the same capacity. He indicated that many of the German tools were unusable due to damage and poor maintenance. Photos of equipment show rust, rat droppings and damaged hydraulic and electrical lines. STW has an interesting background, according to his interviews with us and with the DVB. He received an engineering degree from the DSTA. He joined the military and later was chosen to go to Moscow for additional training in missile technology in 2001. He was in the first group of students going to Russia, a fact which has been widely reported in other sources. Sai describes how he had to appear to be a civilian for this Russian training, and so he was given a false graduation certificate from Yangon University to show to the Russians. He still has both Burmese certificates as well as a Russian certificate from the N. E. Bauman Institute, Moscow State Technical University (MSTU). This is a respected Russian university where he studied many aspects of missile technology. Upon return to Burma he was assigned to the Headquarters of DDSSTRC for a year. He then was assigned to Factory 2, while it was under construction and worked primarily on missiles. An example is that he programmed the CNC machines to make a prototype impeller designed at DDSSTRC; however, the impeller quality was unacceptable due to the limitations of the machine tool. Sai was part of a group which received missile training. Another group, where he also had friends, was sent to Russia at the same time, circa 2001, for training in nuclear technology. Many were trained at the Moscow Engineering Physics Institute known by its Russian acronym, MIFI. This university specializes in the nuclear side of technology, such as mathematics, physics, computer codes and theory. At one time it was the primary training school for the Soviet nuclear weapons experts. Other Burmese students went to the Mendeleev Moscow Chemical Engineering Institute. This university trained the Burmese in chemical technologies related to activities such as the production of uranium compounds to be used in the nuclear fuel cycle. After all of the students returned from Russia, STW lost direct contact with them, but he knew that the mechanical engineers with nuclear training went to Factory 1 and the ones with more specific nuclear training went to the Nuclear Battalion at Thabeikkyin. There are still Burmese military students in Russia today. All of the new information brought out in photographs pertains to chemical processing. There are no pictures of nuclear bombs or reactors and only a tiny bit allegedly on Laser Isotope Separation (LIS). The information is all related to the chemical side of the nuclear fuel cycle. The technologies of interest are the following. The bomb reactor is easy to recognize from its properties and from the fact that STW supplied a letter from the Nuclear Battalion to Factory 1 requesting a “bomb reactor.” The bomb reactor was to be used by the “special substance production research department.” This group is located at Technological workshop (5), whose location we do not know. “Bomb Reactor” is an unfortunate pair of words in the nuclear context. The object is not a “nuclear bomb” and it is not a “nuclear reactor.” It is simply a very strong vessel to contain a violent chemical reaction. Hence it is a bomb in its strength and shape, and a reactor for containing the reaction of UF4 and magnesium (or calcium) metal inside. The term bomb reactor is synonymous with “bomb reduction vessel” or even “reduction vessel.” This terminology is much less emotive. 1. Request No (1) Science and Technological material production workshop to make Bomb Reactor needed for research material for the use of special substance production research department at technological workshop (5). –	(Please) carry it out. One thing that will jump out at the experienced reader is that there are no tolerances or materials listed on this sketch. The source himself noted that the drawings from the Nuclear Battalion were very unprofessional. This factors into our assessment that the Burmese nuclear program is quite primitive. The finished bomb reactors are pictured side by side in this image from Factory 1. One of the reactors has obviously been subjected to great heat and is discolored and paint has burned off as it would be if it had been used to reduce metal. The other is new. There is an image of the two vessels in a packing crate being received from the Nuclear Battalion, so for some reason an unused vessel is being returned with an older one. STW did not see these vessels, only the photo, so he was not aware of any health and safety precautions. There are no safety precautions such as contamination control in any image of the factories that we have seen. There is no information about ceramic crucibles, boosters, igniters or such things. The factory simply built the items and shipped them elsewhere for use. A rough estimate of the amount of metal that could be produced in this reactor is about 20 – 25 kg. That would be criticality safe and could be used for natural or enriched metal. Bomb reduction is done in other industries besides nuclear but it is relatively rare. The technology was widely developed during the Manhattan project to make uranium metal for reactor fuel and for weapons in ton quantities. A bomb reactor built by a special factory, subordinate to the Army Nuclear Battalion is a very good indicator of a nuclear program in the context of many other things. STW described the construction of a simple vacuum glove box produced at Factory 1. The box was used to mix two materials together when one of them was highly susceptible to oxidation. He describes evacuating the box and backfilling it with inert argon for the mixing to take place. Our interpretation for this glove box is that it is used for mixing UF4 with magnesium metal for the bomb reduction to uranium metal. Figure 14. Inert Atmosphere glove box. Vacuum pump is behind the man on the right. Vacuum glove boxes are not an everyday item in industry. This one is quite crude but STW’s description of it being used to mix readily oxidizing chemicals is certainly credible. He also noted it would be cheaper to buy a glove box like this than it would be to make it. Possibly this was because the project was classified. Inconel © is a nickel based alloy used in nuclear industry applications where fluorine or hydrogen fluoride (HF) is used in the process. Fluorine is highly corrosive and destroys steels at high temperatures, such as in furnaces. Inconel is also used in a variety of other applications ranging from the natural gas industry, to turbine blades and even Formula One racing car exhausts. So the use of Inconel is not a unique signature of nuclear fuel cycle use. The terminology used by this source, “fluoride bed reactor” does offer more clues. It would seem that fluorine is involved and fluorine is a component of the nuclear fuel cycle and a very corrosive one. UF6 can be produced by placing UF4 powder in a fluidized bed reactor and agitating it in a high temperature section by a stream of fluorine gas. It is likely that the assembly shown in the figure is the entire fluidized bed reactor. The can at the bottom collects solids that are not fluorinated and are not wanted in the product. The size of this reactor suggests a prototype or pilot plant size. Figure 15. The “fluoride bed reactor” assembly. Note the Trumabend V-130 machine on the right and the Trumatic L 3030 laser cutting machine in the background and compare to Figure 6, the shop layout of Factory 1. STW had only seen drawings of these tubes but he believed that they were for the carbon monoxide (CO) laser at Thabeikkyin. That is certainly a possibility but they appear more likely to be tube furnaces for the fluorination of solid uranium oxide powder to solid UF4powder. They are certainly tubes that have been heated and there are metal “boats” for holding powder to be reacted. Two have been subjected to heat and one appears to be new. This would be step 5 in the fuel cycle diagram above. An interesting item fabricated in Factory 1 is a “Steel Collectors and Nitrogen Container” (their terminology). From its design it looks like an attempt to build a cold trap to catch UF6 gas on high surface area plates with very cold liquid nitrogen as the refrigerant. Other items include a large mixer “Water Reduced Tank”, an “Automatic Autoclave Sterilizer”, and a “Burning Chamber”. These are not particularly unique or part of the nuclear fuel cycle. The burning chamber is shown in the next figure, only because it illustrates the crude workmanship of the items seen. The open source literature is filled with reports of a nuclear reactor in Burma. We are tempted to believe that this could be layman’s confusion over a nuclear program in general, because uninformed sources can be very loose with terminology. One thing is clear, that many people have heard of a Russian plan to sell a reactor to Burma around 2001. It is very clear that the reactor was never sold and it seems unlikely that Russia would do so today. Russia’s ROSATOM did announce intent to sell a reactor to Burma in 2007, but this deal has not been consummated owing to financial and practical legal issues. (14) An absolute condition for Russia to sell a 10 MW research reactor would be that Burma sign the “Additional Protocol” with IAEA. (15) The Additional Protocol is a voluntary addendum to an existing safeguards agreement such as the standard INFCIRC type 153 agreement in force with Burma today. The Additional Protocol provides the IAEA with greater rights to ask for details of existing declared facilities (there are none in Burma so far) and greater rights to probe into undeclared activities of the type we are alleging. 100 countries in the world have agreed to an Additional Protocol. (16) Unfortunately, some critical ones, such as Syria, have not. With the many open source claims that Burma has a covert nuclear program, this might not be the time they would agree to sign. The Russians should not even consider selling a reactor to a state with weak and obsolete IAEA agreements. In addition, a 10 MW nuclear reactor is a very small reactor, suited mainly for producing medical isotopes, conducting nuclear physics experiments, and training engineers and technicians in nuclear technology that could eventually be used to build a larger reactor. A 10 MW reactor is a very poor source of plutonium and is of little interest in most countries inspected by the IAEA today. It would be inspected and monitored on a routine basis and misuse would be difficult. Therefore, reports that a reactor has been sold and that Burma is building a 10 MW reactor on its own seem far fetched and pointless. What is of far greater concern is the possible tie to the DPRK. Some sources, albeit not well-vetted, allege that DPRK technicians are helping to build a reactor in Burma. This immediately brings to mind the 2007 bombing of a facility in Syria that allegedly was a DPRK designed plutonium production reactor. This highlights the fact that DPRK is willing to build at least one reactor outside its own territory. Thus, any rumored activity in Burma should be taken seriously. So far no sources have given adequate coordinates to locate a suspected nuclear reactor in Burma but this is a high priority item for more information. The DVB source provided a great deal of information on a Laser Isotope Separation (LIS) program at the Nuclear Battalion. From the outset we will readily agree with critics that a laser isotope separation program is far beyond the capabilities of Burma with its poor technical resources. Nevertheless STW has a lot of details about the program, and if Burma chooses to spend its resources in this way it is heartening to those who wish them to fail. Laser isotope separation has been a huge research program in many countries, such as the US, UK, France, Russia, Germany, South Africa, Australia and probably others. None of these advanced industrial countries has succeeded in making significant amounts of enriched uranium at anything close to a competitive price. There are two common approaches to Laser Isotope Separation. This is an overly detailed topic for this paper and will be summarized. STW had been clearly told that he was to make some precision nozzles for a supersonic carbon monoxide (CO) laser that would be used in the LIS process. Carbon dioxide (CO2) and CO lasers are normally associated with the Molecular Laser Isotope Separation (MLIS) process. This process uses UF6 as the chemical working substance, the same as centrifuge enrichment. STW was asked to machine many prototype nozzles for the lasers, in batches of ten or so. He remembers them because they were difficult to make and required electrical discharge machining, one of his special skills. A sketch of a nozzle is seen in the next figure. Note again that the sketch is not a proper engineering drawing, lacking tolerances other information. It is our view that the LIS process is far beyond the technical capabilities that we have seen elsewhere in Burma. This technology proved too complex and expensive for several industrialized states. It is common, however, in the developing world for scientists educated in universities in industrialized countries, to return home and sell high technology programs to government bureaucrats. The explanation here is probably simply that some academics have foisted this project off on the government so they can do research and publish, knowing that they will not succeed in the programmatic aim. STW heard reports of a gas centrifuge program. One of his colleagues who studied nuclear technology at MIFI in Moscow said that the Nuclear Battalion was working on centrifuges, and if a plant was built it would be near Taunggyi. The prototypes were being made of plastic as far as he knew. No further information was available on this topic. As an aside, when STW was discussing his military training in the 1990s, he mentioned fiber composites. He was aware of a military program to manufacture rocket bodies from some type of fiber. His military instructor had told the students that the process was not reliable because the tubes “vibrated too much”. He had no more information on this topic and he did not tie it to enrichment himself, only as an answer to what kind of materials might be used. Burma became a State Party to the Nuclear Nonproliferation Treaty in 1992. It acquired rights and obligations under this Treaty. The agreement is known as Information Circular 477 (INFCIRC/477). (17) In particular, Burma signed a Small Quantities Protocol with the IAEA in 1995. This stipulates that Burma has no nuclear facilities and only small quantities of nuclear materials. Nuclear materials are defined essentially as plutonium and uranium, including enriched uranium, uranium-233, and uranium source materials. (19) The precise definitions are complex and are left to the interested reader. (d) Twenty metric tons of thorium. These limits appear complex, but the one of main interest is (b), ten metric tons of natural uranium. If Burma is operating an ore concentration plant and producing yellowcake it will have to consider this limit. Burma is bound to report the import or export of nuclear materials even in small quantities, or if it acquires materials in excess of the limit. If it constructs a nuclear facility it must notify IAEA six months before receiving nuclear material for it. An R&D facility operating a single centrifuge on UF6 gas would have to be reported to the IAEA as an enrichment plant, as would plants for testing uranium conversion. In other words, the IAEA conducts no safeguards inspections in Burma at the present time and would have no right or obligation to do so unless Burma notifies the IAEA of a change in status. Clearly Burma has not done that up to this time. Note that other elements of the IAEA do interact with Burma and carry out visits. The Ministry of Science and Technology of Myanmar is interested in promoting the application of nuclear techniques. The development of human resources is one of the top priorities of the Ministry. The nuclear programme in Myanmar depended on a small aging core of foreign trained scientists and engineers, and training provided to local staff was almost entirely through International Atomic Energy Agency (IAEA) assistance. The DTVE purchased equipment for two factories and claimed to the vendors that it was for educational, non-military use. Based upon STW’s evidence, military personnel work in the facilities making prototype parts for weapons of mass destruction and delivery systems. It would therefore seem appropriate to sanction the DVTE and entities associated with it such as DAE and MOST from any further purchases of manufacturing, machining and inspection equipment on the basis of a false end-user certification. This would include spare parts and assistance for the machines already acquired. States participating in, for example, the Nuclear Suppliers Group (NSG) and the Missile Technology Control Regime (MTCR) should be advised of these findings. A single source, a former major in the Burmese Army, has come to the Democratic Voice of Burma with a large volume of information purporting to show missile and nuclear activities in Burma up until the present. The first question that interested observers will ask is about the credibility of the information. The source and DVB have strong feelings about the regime. Their objectivity can be called into question and so they have asked us to do this independent assessment of the information. The following points show the overall consistency of the information. But each reader will have to make up his or her own mind. •	Sai was well-positioned to acquire information. He was an army major, trained in military science with further training in Russia. He reports credibly about his education at the Bauman Institute in Moscow and on colleagues who studied at MIFI and Mendeleev Institute. •	Many source reports describe the additional training of young military officers in elite Russian universities. This is more quantitative and first-hand than many other open source statements. •	The source was a deputy manager in two factories producing parts for missiles and nuclear programs. •	These factories are well-known. There have been end-user certification visits to both and the details of machine tools dates and customers match. There are photographs of tools and the European installers and inspectors. The German en- user expert did not see military personnel but noted discrepancies in the Burmese story that DTVE operated the factories for student training. •	The source visited Thabeikkyin with two general officers and saw crude demonstrations of alleged nuclear technology. •	A “Nuclear Battalion” at Thabeikkyin has been reported by other sources in sketchy detail. This new information allows more investigation especially using satellite imagery. •	The source reported that uranium ore was being processed at Thabeikkyin and that it was hazardous to health. •	Other sources mention Thabeikkyin in very general terms and also claim that the reactor might be built there. One satellite image shows a small ore concentration plant on a pond and piles of earthen materials nearby. This is not proof of a uranium plant, but consistent. •	The source provided a document about a “bomb reactor” being built for the Nuclear Battalion at Thabeikkyin along with several photos. •	The object certainly looks like a bomb reduction vessel and one of the two seen has been subjected to high temperatures. •	Other equipment, notably an inert atmosphere glove box for mixing reactive chemicals, a “fluoride bed reactor,” UF6 cold trap and tube furnaces are all components of a possible program to make uranium compounds for a weapons development effort. •	This is consistent with a program to make UF6 for enrichment by MLIS or centrifuge and uranium metal for a possible bomb core. From all of the above we conclude that it is likely that Burma is trying to attempt many of the nuclear program steps reported by previous sources. Unrealistic attempts, such as the Molecular Laser Isotope Separation project, unprofessional engineering drawings and the crude appearance of items in photos, suggest that success may be beyond Burma’s reach. Nevertheless, the intent is clear and that is a very disturbing matter for international agreements. If experiments with uranium are taking place, or significant quantities of uranium compounds are being produced, then Burma needs to be reporting to the International Atomic Energy Agency, which clearly it is unlikely to do if it is planning a covert nuclear reactor, an enrichment program and a weapon. The authenticity of the photographs and reports will no doubt be questioned. That is fair and professional. The purpose of this report is to inform and generate thoughtful analysis. The source and chain of custody of this information is clearer than the recent “laptop documents” about Iran’s alleged nuclear weapon program, for example, and that has generated considerable analysis and speculation. Undated and unsourced photos of a reactor under construction in Syria are largely unchallenged. It would seem reasonable to question the authorities in Burma and to hear their explanations. If, Burma denies the authenticity of this information, then time will be the judge. If the authorities deny the information and then are found to have not told the truth, the international reaction should be swift and severe so that Burma does not reach the immunity that DPRK has acquired with its nuclear weapons program. (4) There are legal definitions of “nuclear facilities” and “nuclear materials” in the IAEA statute and IAEA Information Circular INFCIRC/153. Burma has not declared any materials in these categories, and short of allegations that we and others are making, there are no legally declared nuclear facilities or materials in Burma. (8) Transliterations vary and not all places in this report will be written multiple ways. Thabeikkyin is such an important site that it is important to know the alternative transliterations Tha Beik Kyin and Tha Peik Kyin. (13) DVB has carefully examined photographs and noted that personnel who wore civilian clothes during the German expert visit wear military uniforms when the Europeans are not there. (17)AGREEMENT OF 20 APRIL 1995 BETWEEN THE UNION OF MYANMAR AND THE INTERNATIONAL ATOMIC ENERGY AGENCY FOR THE APPLICATION OF SAFEGUARDS IN CONNECTION WITH THE TREATY ON THE NON-PROLIFERATION OF NUCLEAR WEAPONS, Information Circular 477.
interpreted as applying to ore or ore residue. (23) IAEA probes Myanmar data, discourages new research reactors, Mark Hibbs, Nuclear Fuel, August 10, 2009. DEMOCRACY FOR CHINA: WHAT WILL IT TAKE? The most populous nation in the world, China, is a dictatorship. It has been ruled for the last sixty-one years by the Communist Party (CCP). Under Mao Zedong, the CCP was a typical communist regime. The population was kept equal – equally poor. Since Deng Xiaoping, it has become more properly a “capitalist dictatorship.” China today has great, and still growing, inequality. It is a merger of the worst in authoritarian political and economic rule. The CCP provides material and/or diplomatic support to many other dictatorial regimes around the world. These include: North Korea, Burma, Laos, Cambodia, the members of the Shanghai Cooperation Organization (Kazakhstan, Kyrgyzstan, Tajikistan, Uzbekistan), Russia, Belarus, Iran, Sudan, Zimbabwe, Equatorial Guinea, Angola, Democratic Republic of the Congo, Cuba, and Venezuela. In addition, Tibet, East Turkestan and Southern Mongolia are so dominated by the CCP – for the moment at least – that they have been annexed into China itself. We should also not forget all of the problems that emanate from China and which affect the entire planet. These include support for the rogue nuclear states North Korea and Iran (and now Burma); the host of deadly consumer products that have been exported from China (and which the CCP refuses to regulate); as well as wide-ranging environmental abuses. The last extends from an uncontrolled demand for timber, mineral resources and endangered species, which is driving environmental destruction and extinction throughout the earth; to air-borne industrial pollution which circulates it; as well as the CCP’s maneuvering last year in Copenhagen to sabotage international efforts to address climate change. China’s more than one billion people are being denied freedom and human rights. The CCP’s client states have a total population that approaches another billion, and which similarly are denied their rights. Approximately one-third of the world’s population is repressed, either directly or indirectly, due to the CCP. All of these countries, starting with China, have human rights movements and associated advocacy groups, which protest against the manifold ways in which the regimes abuse the peoples’ rights. Many of these groups, though, while laudable, in particular because of the dangers – of arrest and torture, even murder – that their leaders and members regularly face, are nonetheless based on an incorrect premise. They believe, or at least they act on, the assumption that human rights can be improved without change to the regime itself, in other words, that human rights can coexist with dictatorship. This is a fallacy. There can be no human rights without democracy. A dictatorship may pay lip service to human rights, even allow the people some specific rights from time to time, but our full spectrum of rights can never be established and preserved within a dictatorial system. Indeed, democracy is a system designed to protect human rights. Dictatorship is predicated on their rejection and abuse. The people of China, and also Tibet, East Turkestan and Southern Mongolia, will continue to be denied their rights until the CCP loses power and China becomes a democracy. Other dictatorial regimes will continue to receive CCP support. The rest of the world will continue to suffer the problems that arise out of mainland China. The question, then, is how can the Chinese people achieve democracy? What will this profound transformation require? The CCP is strong, and its strength is increasing every day. Notwithstanding factionalism within the Party, the leaders are united around the goal to preserve their rule. A key element underlying this unity is the CCP’s wealth. Chinese businesses have profited enormously from the sale of consumer and industrial products, which the world has been happy to buy. The Party takes a substantial percentage of this trade, hence its accumulated reserves of $2.4 trillion. In addition, with its wealth the Party has been rapidly upgrading its military capability. The People’s Liberation Army is now equipped with advanced weapons systems that have been internally developed, secured through espionage, or purchased from authoritarian allies such as Russia. The International Community has been dithering about the rise of the new China. The hunger for cheap goods has convinced the rest of the world to ignore the totalitarian nature of the CCP and its many, many abuses. The Party further has conducted a full-scale charm offensive, buying loyalty from different nations around the globe, particularly in lesser-developed regions and whose own leaders are also authoritarian. China is actually creating a dictatorial block that constitutes a modern form of imperialism. Whereas Rome conquered other nations and peoples by force, China, the new Rome, is doing it quietly and with money. The natural source for resistance to CCP rule and a demand for democracy is the Chinese public. Within the country’s large population, though, there are many different groups. A great number of people actually belong to the Party, or work for or otherwise benefit from it. The CCP further has created the largest propaganda machine in history, which has the dual goals to promote communist rule and to silence all dissent. This propaganda machine is coupled with the similarly largest censorship exercise in history, notably through the Great Firewall that restricts access by the Chinese people to the Internet. Benevolent dictatorship is the theoretical alternative to democracy. It claims, among other things, that people are unable to govern themselves: that like sheep we must be led. This is certainly arguable, but the position also has numerous obvious flaws. How do we choose who gets to lead, and how do we prevent them from abusing their power? As China saw under Mao, absolute power often has horrific consequences. And, even if under a particular ruler, or emperor, life is good, there is no guarantee that the next will also be benevolent. Indeed, the odds are, as Rome itself experienced, that tyrants will follow just leaders. Finally, as the people in such a society experience abuse, they become resentful and ultimately attempt to rebel. It is an inevitable cycle with this type of system. In China, CCP members and cronies, and some portion of the general population, accept dictatorship. Most people, though, cannot be bothered with political concerns. They are too absorbed with their daily struggle to worry about such matters. Contrasting the pro-regime factions, and on the other side of the silent majority, is an active and growing movement for change. This movement, though, is fractured. The largest elements are human rights groups, which are seeking relief for a wide variety of problems, including corruption, inequitable land distribution, sweatshop working conditions, religious persecution, political prisoners, and environmental crimes. A key participant here is the Falun Gong, which is seeking freedom to practice its spiritual exercises. This is a human rights motivation, and it is notable that the Falun Gong fully supports Confucian ideals. The largest independent “internal” movements, for Tibet, East Turkestan and Southern Mongolia, also focus on improving human rights, for the Tibetan, Uyghur and Mongolian peoples, not an outright demand for freedom and independence (although such groups have made it clear that they support democracy in China as well). The few internal groups that actually focus on democracy are small (although they are highly motivated), and include the Charter 08 movement and the China Democracy Party. Finally, there is a large population of Chinese people who reside outside the mainland yet have an active concern for its problems. Many of these people advocate through groups that focus, once again, on human rights issues. A few, though, such as the international branches of the China Democracy Party, and also the Overseas Chinese Democracy Coalition, concentrate their efforts on opposition to the CCP and the need for a transition to democracy. This means that the burden for change falls to the Chinese people. Of course, one can argue that this is as it should be. People are responsible for themselves, and if they are the subjects of tyrannical rule, they must lead the way to overthrow it. The problem with China then is how can Chinese people who are already pro-democracy activists encourage more people, ultimately a critical mass of the population, to support this change. There are two factors here. First, the Chinese need to be taught about democracy. They need to understand the ideas on which democracy is based; why it is preferable to benevolent dictatorship; and also the different aspects and variations of the democratic system that are in use around the world. This way they will become politicized, and develop a strong desire for democracy, and through this a willingness to act, and sacrifice, to fulfill this desire. Secondly, they need to learn that human rights are predicated on democracy. If they want human rights for China, and if their own rights have been abused, in addition to making such a demand, and protesting such abuses, they should join the movement for democratic change. The Charter 08 document and the China Democracy Party should have millions of signatures and members. The challenge of course is disseminating this education in the face of the CCP’s propaganda and Internet blockade. It is here that the International Community can be of assistance. The Great Chinese Firewall is not impregnable. Initiatives such as the Global Internet Freedom Consortium, through which Chinese people can bypass the Firewall, are already having a large impact. (The Falun Gong is the primary organizer of the GIFC.) The democratic nations of the world, notably the U.S. (which has budgeted large sums to support the GIFC, but dispensed only a small amount), should do everything possible to create a free information flow. And, all democratic nations and groupings, e.g., the E.U., should again make democracy and human rights the foundation of their foreign policy for China. Will China require a revolution? Must there be a pro-democracy revolution to erase the results of the 1949 communist revolution? One would hope not: that democratic change can be accomplished in China non-violently. Unfortunately, however, having hopes and dreams does not guarantee that they will come true. In the real world change to democracy has invariably been accompanied by either a popular uprising or a military coup, or both. As a result of the global financial crisis, business activity in China began to slow down and popular unrest to escalate. I have argued for years that there should be a global boycott of consumer products from China. Call it tough love, or whatever you like, but the Chinese people do have the power to overthrow the CCP. A little push wouldn’t hurt. Then, when China is free, trade can be resumed and the proceeds used to build schools and hospitals, not guns and missiles. Two things are certain with China. For the first, democracy is preferable to the rule of the CCP, but defeating the Party and establishing it will be difficult. All human rights groups, including the Falun Gong, Tibetans, East Turkestanis and Southern Mongolians, should actively organize – both underground operations and international diplomacy – for democratic change. Indeed, if they maintain their primary focus on human rights concerns, such concerns will never be resolved. Secondly, we, the people of the world, can work to make a difference. If our own political leaders, because of corporate lobbying, choose to back the CCP, we can act on our own to help the Chinese people. Other than activism within China, the biggest impetus for change will be if either of the neighboring regimes in North Korea and Burma collapse. We can help bring this about as well. The CCP’s goal is to create a one thousand year empire, that dominates a globe filled with authoritarian allies. This is identical to Adolf Hitler’s dream. Everyone who enjoys or aspires to freedom must work to prevent this from happening.